So I was in Washington and New York some weeks ago (already too long, I start missing it!! ), and altruistically supported the american recovery by byuing lots and lots of stuff, and not only clothing (as one maybe would expect), or technical items (as would be reasonable), but also various things I need/can use/ don't need but would love to have for my little baking addiction. Since I bake along with Tuesdays with Dorie, I did not only learn enourmously much about baking and a huge amount of vocabulary, but I also read quite often about some things that do not exist in Europe, or are very unusual over here, and therefore hard to get. So I got curious. And besides my long "where to go and what to see"-list I had another, merely theoretical list in my mind with things to have a look at and see what they actually are (or, where I knew what it should be, have a look at what it costs and decide whether it makes sense to risk taking them back to Europe and having them confiscated at the customs). The list basically consisted of wheat germ, chocolate chips of various kinds, Trader Joe's (boy, I read so much about this store, I was so excited to find out about it!! 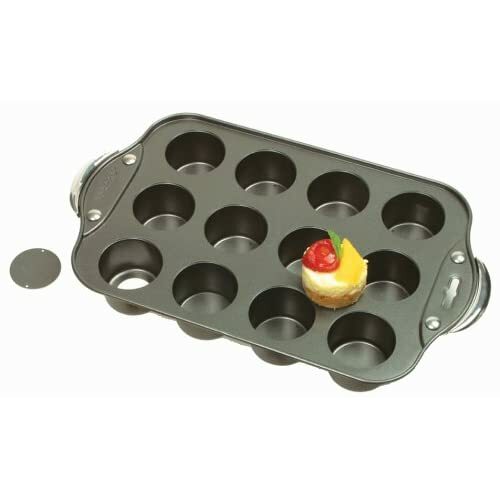 ), variuos baking forms/molds, vegetable shortening, corn syrup, fancy sorts of peanbut butter. Chocolate chips - yes, found them, saw them, bought some. I went home with a pack from Trader Joe's (Lucky me, a Trader Joe's was just nearby my friends' appartment) and a peanutbutter chip pack, where I forgot where I picked it up. I saw a lot more, colourful big chips in a wonderful store in NY specialized in baking, but that was at a point where I already had the first two packs, and I wasn't sure if I would ever use frog-green or crimson red chocolate chips. Today, I regret especially not having buyed the red ones because I guess they are perfect for Red Velvet Cupcakes. Mais - tant pis. 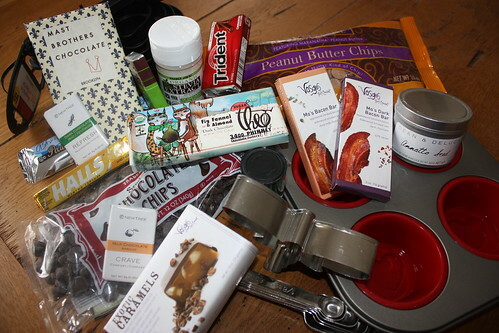 So I added to the chocolates and sweets I brought home some other baking related items. Uh, and I almost forgot, I found some wonderful, pretty spoon measures, and some practical, more or less ugly cup measures and despite I got a cup-measure for birthday, I just had to take them! And I found a cookie cutter that is shaped like a dragon-fly, and one of my friends loves dragon flies, so I had to take it, too. And I found Stevia, of which I had heard a lot, but it is almost impossible to buy it in Austria (in other European countries it is better), because the sugar lobby works against the accreditation. And I had to buy tons of cinnamon chewing gum (don't ask me why they don't sell it in Europe...) and the Lemon-Honey-Halls, which are the best, best, best relief for a slight throat ache (also not available, at least in Austria). And I had to buy some spice at Dean&Deluca because the packing is just too pretty to not take. I have no idea what annatto is. The dictionary tells me that it translates to "Annato" - very helpful... So I have also no idea what to do with it. But I love experiments, and this spice was the only one, I absolutely had not a single idea about what it could be... Someday I will find out. Great post! I enjoyed it.